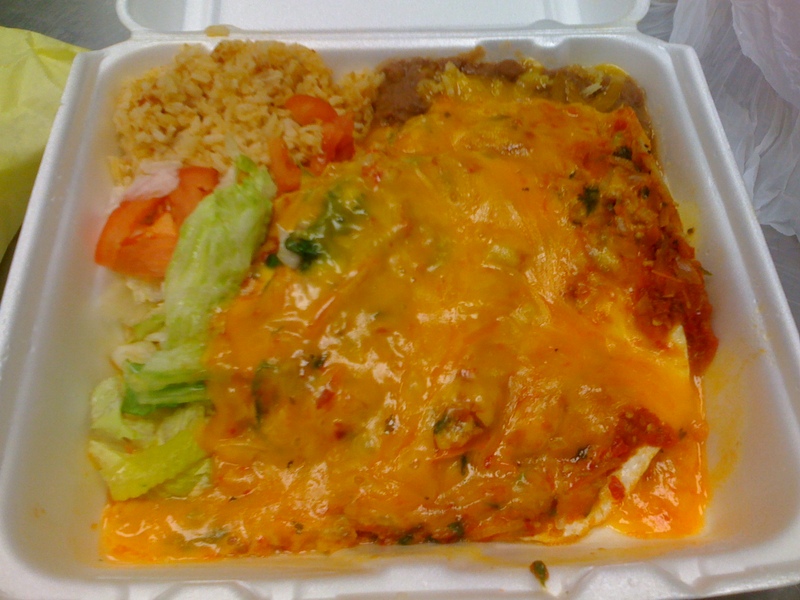 Huevos Rancheros. I took a page from Chavo as I was feeling all bleh because I had to go to work. So I decided to get up an hour earlier and I made my way to Jim’s Burgers. I didn’t feel like pancakes that morning so I thought to myself, What would Chavo Do ? “Buenos dias muchacho, que le doy ? ” Buenos dias, deme uuuuunnnnnnnoooooossssssss huevos rancheros con un cafe grande por favor. Damn did they ever hit the spot. They may look like a nuclear accident, but don’t judge a book by its cover. These huevos were good. The tomato sauce and healthy helping of cheese made it a messy meal, but damn worth it. The rice and beans were fine and the tortillas as well. Nothing fancy there. But if you’re looking to get rid of that June gloom and eat something so wrong that it feels right, call me up and we’ll meet at Jim’s. This entry was posted in East Los, Eastside, Food and tagged boyle heights, Huevos Rancheros, Jim's Burgers by El Random Hero. Bookmark the permalink. “Healthy helping of cheese” made me laugh! 🙂 Looks like the dishes I’ve spotted here in Southern AZ. Makes me miss home something fierce. Impossible get anything like this in lame New England. I’ve only eaten at Jim’s once or twice for lunch, but my step-mother swears by their breakfast burrito. I don’t even like, or eat huevos anymore (my mom burned me out on eggs when i was a kid) but that plate sure looked so tasty, I may be tempted to try it some day! !